D-Day Battles for France by Back-Roads Touring Co. The largest amphibious invasion in history took place on the beaches of Normandy, France on June 6, 1944. Allied forces from the United States, Canada, Britain and France waded ashore that day to establish a beachhead in the north of France. Sailing from bases on the southern coast of England, the forces landed on five French beaches with the codenames Sword, Juno, Gold, Omaha and Utah. The successful invasion paved the way for the eventual victory of Allied forces in Europe and the end of World War II. Today, those same beaches on the coast of France are still known by their D-Day code names. Throughout the area are plaques, memorials and museums. The World War II Museum, located north of Utah Beach, The Le Memorial De Caen, and the Museum of the Merville Artillery Battery each present interactive exhibits, videos and topographical depictions of the events of D-Day as well as representations of life in occupied France. Iconic moments from the invasion such as that visited on American paratrooper John Steele, who was accidentally caught on the church steeple at Sainte-Mère-Église as he parachuted into the town are commemorated. It is, however, the cemeteries with their rows and rows of white marble crosses and Stars of David dotting the landscape, that most vividly present a crushing reminder of the cost of freedom. 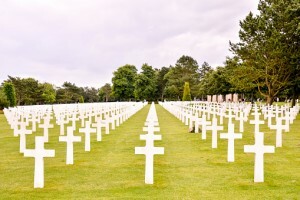 The American Cemetery is located in Colleville-sur-Mer. The Bayeux War Cemetery holds 4,648 British casualties. Few visitors are unmoved by the solemn site of the memorial to so many dead who gave their lives for others. Nearby at the Bayeux Tapestry Museum is the embroidered masterpiece tapestry from the 11th century commemorating the Norman Invasion of England from the beaches of France. Eight centuries later, those same beaches saw the English forces with their Canadian and American allies again at war fighting with immeasurable courage. Visitors are reminded how closely our histories are tied to conflict and can only wonder at the terrible weight of sacrifice. Welcome to Battlefields by Back-Roads Touring. We have been operating WWI and WWII tours in Western Europe for over 20 years. Led by expert battlefield tour leaders and operating with small groups only, our tours offer a truly personal experience. Our goal is to give you lasting memories to add to your family history. With their vast knowledge and unequalled passion, our tour leaders make the events that took place in the now peaceful fields of Flanders, the beaches of Normandy and now the streets of Dublin, come back to life. Our tours offer the flexibility to include visits to specific cemeteries, not listed on the itinerary, for those looking to pay their respects to a fallen relative or family friend. We consider it our privilege to be able to join our guests for the often moving experience of visiting the grave of a relative or walking in their footsteps along the front.